Man saves child from falling by climbing and is dubbed Spiderman of Paris. The incredible real-life "Spider-Man" who saved a boy from falling by climbing four levels. 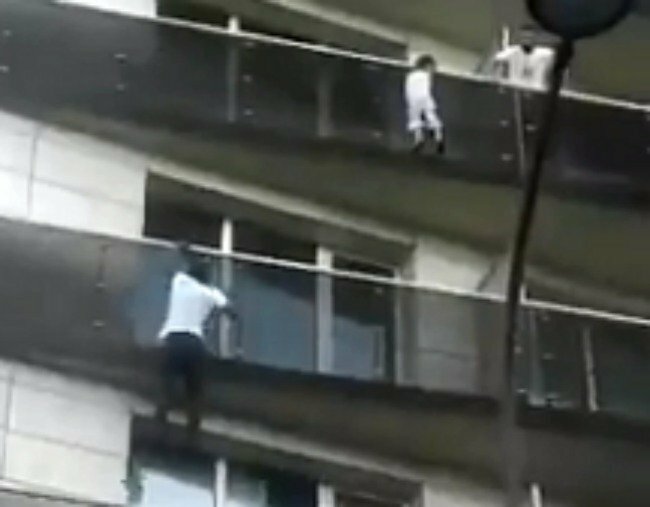 A man’s incredible rescue of a child dangling from his four-storey Paris balcony was captured in a clip that has to be seen. Mamoudou Gassama took less than a minute to jump and climb up the side of the building – risking his own life in the process – to reach the four-year-old boy before he fell. The 22-year-old has since been praised as a hero for his daring rescue – and even dubbed “Spider-Man” by the city’s mayor. About 8pm on Saturday the boy was spotted dangling from his balcony. A neighbour tried to reach him from his own balcony, but because of the barrier in between, could not get a firm grasp on the little boy. “I saw all these people shouting, and cars sounding their horns,” he told reporters on Sunday. The young man, who recently migrated to France from his home in the west African nation of Mali, said while he didn’t think twice about saving the boy, the incident did leave him shaken. Paris mayor Anne Hidalgo said on Twitter that she had phoned Mamoudou to thank him for his “act of bravery”, calling him “Spider-Man of the 18th” (the district where the incident occurred). French president Emmanuel Macron later met with the man and went one better. In addition to thanking Mamoudou and awarding him a medal, he said the man would be made a naturalised citizen of France. Meanwhile, the boy’s parents – who early inquiries suggest weren’t at home at the time – have been investigated by police, The Guardian reports. They found his mother was not in Paris at the time, but have arrested and questioned his father over leaving his child alone without adequate care. It is not yet know what charges he may face in court.